Hi, how's it going guys? Today has been a little bit better, still trying to hang tough as you can imagine. I'll be fine then suddenly look at a photo on my phone and start crying. One day at a time. Anyway I know I'm a bit later than normal with this post, but I figured I'd push myself and get it up. Better late than never in my book. Today I'm continuing the November edition of the Challenge Your Nail Art Facebook group and the prompt is 'Fall Food'. Of course, I had to instantly think of pie! Pie is universal and all-year round, but for the Fall you get Pumpkin. So much gratification in one little slice of heaven. Yum, who else looks forward to pumpkin pie this time of year? Or maybe some nice coconut cream pie?! That's my personal favorite! Doesn't my little pie look almost too cute to eat? Haha. I found the image during some Google searching and I knew right away I had to replicate it on my nails. I have come to realize I like doing more 'cartoon-like' things rather than realistic. Just a lot more fun and less stressful when you're in a rush or not focused. Polishes used are Zoya's Rue and Jior Couture's Up and Autumn (which has got to be the best orange this season). I used single chevron vinyls from @Teismom (NailVinyl.com). And last but not least, my little cutie pie was done completely with acrylic paint and a detail brush. As always, don't forget to check out the other ladies participating in today's prompt. Okay, this is super cute!! I just love it. I'm not a pumpkin pie fan myself, I like fruit pies or cream pies. I totally could not eat that adorable piece of pie!!! How cute!! Great design! Your pie is so cute! I could just pinch its cheeks. . . and then eat it. . . 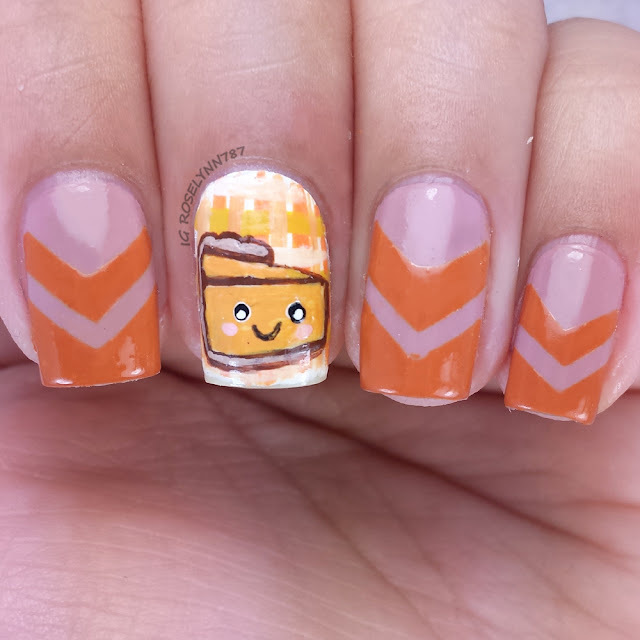 Your pie is so freaking cute! 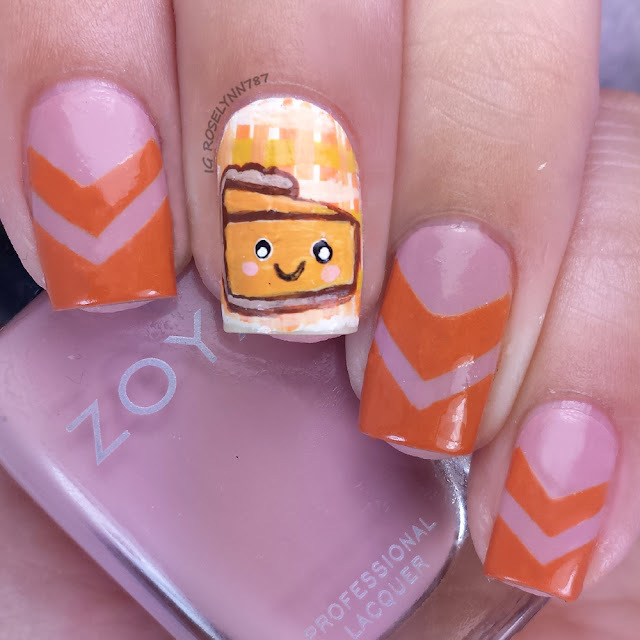 That pie is so friggin cute! Now there something I never thought I would say haha!